More links for "EPIC Gaming Chair - Black/Red"
I use an EPIC chair at work because I wanted something that looked good in the office. I am a marketing professional and wanted something more striking for the office. Also this chair has been extremely comfy over long period of time. Awesome chairs, be careful setting up! This chair is amazing! And it is soo comfy I almost fell asleep in it after work! I’m not one to usually write reviews, but this is more for a safety point of few during set up! So during setup there is A stage which requires you to pull the backrest adjustment lever. There is a tiny “WARNING” label on one side saying to be careful of your fingers as the metal snaps back once pulled. Now this is only viewable if you stand on one side of the seat, I however was on the opposite side “lever on the right I was stood on the left of chair” and as I pulled the lever it ALMOST caught all four of my fingers. Now this is a chunky piece of metal and it snaps back violently. I personally believe there should be a bigger warning label as when you are excited building your chair you don’t always notice small labels. So now that is out the way, this chair is the best! If you’re thinking of buying it then just do it... you won’t regret it! It’s soo beautiful to look at. Sometimes it looks that good you don’t even want to sit on it incase you ruin it! love this chair, massively customisation, great lumbar support, and amazing quality. I put off buying a chair for ages as I had an old crappy office chair which was fine and I couldn’t justify spending money on a new one. My wife suggested to get one for my birthday so I started looking in the mid range around ~£150. I found some nice looking chairs on OCUK for that price. Then this chair caught my eye! My rig colour is black and red, and this chair matexh my colour for starters. Something about the design also jumped out at me. Sporty, yet comfortable looking but it was twice the price! I checked it specs and it screamed buy me! The chair is extremely sturdy with a strong metal base, rigid wheels and excellent stitching. The leather is of high quality, with a soft feel and extremely breathable. The seating is soft as well which aid in seating longevity. The chair is quite big and stands tall , with my head sitting near the top (I’m 6ft) the two cushions are fantastic. Ie for lumbar support where my back is prone to aching, and another to rest my head when I sit back and relax into the chair. That do a fantastic job in aiding comfortability. This chair really was worth spending that little bit of extra money. It really does make you feel like a king on your throne whilst you game. I've had my noblechair for maybe 2 weeks now and I can safely say, I've never been more comfortable. I sit at my desk for 10 or more hours every day and I used to get some pretty bad back ache when using my previous generic desk chair. 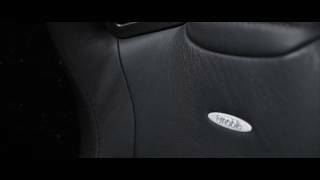 As soon as I started using the noblechair, I noticed after a long day, I didn't get any pain in my lower or upper back due to the lumbar support cusion the noblechair comes with. Its is a life saver and can be adjusted to whatever suits you best. Also, the customisation for the back is great for whatever mood I'm in. Whether I want to sit up and be in full concentration mode or chill out and watch a film, I can do just that. I was skeptic at first, spending so much money on a chair and I couldnt find a chair with so many adjustments and features for less money that didnt have bad reviews. So I went for itt, i really needed a comfy chair with good lumbar support as I have siatica and I have to say I'm not disapointed, its a fantastic buy and a great comfy and stunning chair to own. Well worth the money! I've owned an Epic Series Black / Red Noblechair for a few months now and I absolutely love it! It oozes quality and unlike other gaming chairs I've used in the past all its components are very well built! The chair is wonderfully comfy and features great back support too with an adjustable back pillow included! Setup took around 25mins and the instructions were clear and precise. Overall if you're looking to invest in a chair to support your daily computing needs be it office work, gaming or anything else I can definitely recommend a Noblechair! One of the best gaming chairs money can buy, had mine for over a year now and still maintaining it's high quality as of when I got it. Super comfortable and have had no problems. This is one of the more important pieces of information that must be correct in order to prevent the chair failing on the first sitting potentially causing injury. Now, to the good. This is everything else about the chair. It looks very sleek, the black/red combo is very nice, so far it feels comfortable to sit on, the reclining function is excellent and goes very far back and forward. The wheels roll across my laminate floor very well, the armrests are actually very good and can be adjusted to suit the way you sit. The pillows for the head and back are welcome additions, although I am yet to use them both. Moving on to assembly there's not very much to say other than it is very easy to assemble. Took no longer than 20 minutes to assemble fully, if that. To summarise, the whole chair feels sturdy and like it is built to last, but given it is £300 at the time of purchase that's not surprising. I do recommend this chair but remember that it is rated at 120KG MAX weight not 180KG. Excellent quality chair, fairly easy to assemble. I'm 6ft 2 - so no problems with the height adjust, but the Mrs at 5 ft 3 doesn't find it comfortable - I would agree with the other posters that if you are under 6 ft definitely find one to try before you buy. If you are over 6 ft this is the best chair that I could find for the money - you won't be disappointed. I ordered the black and red epic series noble chair and it arrived when it was supposed to however the red stitching on the upper body part of the chair was all over the place and the left arm rest was dodgy. I had to ask for a replacement which took over a week to get sorted being as dpd hadn't returned the chair i was unhappy with. I phoned overckockers and complained about the situation and was sent a new one the same day which has arrived and am very pleased with finally. I needed something to help me during long study sessions that didn't aggravate my lower back after 30 minutes of sitting. And after several months of use I'm glad to say this is the chair. The first couple of days were a bit rough, but after that I could sit for hours without realising (particularly great if you're gaming and lose track of the time!). The finish on this chair is fantastic, and after extensive use everyday I've yet to notice any sign of wear. I've had chairs in the past where something starts to fray or come loose after a couple of months but I'm glad to report this hasn't happened yet. The chair itself is fantastic, but there are a few comments worth noting as others have mentioned. The first being the instructions included; they aren't great. It's not too difficult to figure out how to assemble the chair, but there was an element of trial and error involved. The chair is also very heavy! Which is actually a good thing since it's a good sturdy chair. But as someone who didn't have an extra pair of hands to help it was pretty hard to get it together. There were a few niggly bits that would have been a lot easier to put together if there was someone there to assist. Overall it took about an hour to assemble and I was sweating after it. Definitely get someone to help if you're looking to get it up quick. I also get the impression this chair is designed with guys in mind, or the tall, at least. I'm 5'6 (female) and my feet hang a couple of inches off the ground. If I flex my feet my toes can touch the ground, and this is with the chair on the lowest height. This leads to issues with posture and having your legs dangle. Luckily for me I have a foot rest I can use, so it's not a problem for me, but it's important to consider before buying. The two pillows included are nice - very comfy and soft. I just wish they had a removable cover that was washable, especially the neck pillow. There are a few things that could be improved, but I don't regret spending £300 on this chair. Once you get it assembled it's a dream. It looks great and is super comfy to sit in. Would definitely recommend this chair, and would probably buy another one for work when I get the chance. Being someone of larger stature, getting a chair that doesn't feel like it's about to fall apart on you is challenging. However, my Epic Series doesn't disappoint. It's well put together, easy to assemble and is very comfortable to sit in whether it be upright for gaming or reclined to chill and watch a film or TV show. Highly adjustable so you should be able to find a set up just right for you. Comfortable with additional cushions to allow you to get it just so. Bucket style seat not wonderful for a wider person. Seat height on its lowest setting is still quite high, so a shorter person would likely struggle without a foot rest. Package weight. This chair isn't light when delivered, so you will likely find yourself sliding it to where you want to assemble it or unpacking it and moving the components individually. Whilst it took a little bit of time to get used to, I wouldn't go back to a normal desk chair now unless I absolutely had to. I'm very happy sitting in the chair for a long gaming session or to binge watch a TV show. I can easily see this chair lasting me for years to come, something I can't say about the other normal office chairs I've had in the past. I spent a lot of time researching the best chair and hopefully some of what I say here may be useful to someone. I'll try and cover everything I can here so this will probably be a long one. I'm a 3D games artist and therefore spend a lot of my time working at my PC. I needed a chair that would keep me comfortable and support my back whilst I work/game. I wanted a chair that was both high in quality and extremely comfortable. This chair meets both of those requirements. If I am splashing out £200-£300 on a chair I want to make sure it's of the highest quality possible and that it will last. After doing some research on Noblechairs I found that quality is one of their primary goals. 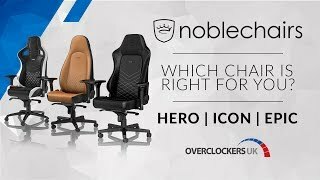 Noblechair's passion for quality was something that was missing from most of their competitors and this immediately drew me to them. The price of this chair was a little more than I was hoping to pay (I had originally planned to pay around £200) however I decided that I could justify paying a bit more as a chair isn't just about the aesthetic but it is also about your health. Plus I spend upwards of 10 hours a day at my PC working and sometimes gaming so I felt I could warrant spending the extra money and boy am I glad I did. I could tell as I was building this chair that it is of extreme quality. I was a little skeptical of building my own chair at first as I haven't built much furniture before but the process was very straightforward. I had a friend who helped me with it but you could quite easily build this chair by yourself. The build process took around 20 minutes. I'm exactly 6 foot, and quite thin (I weigh about 12 stone/76kg). This chair fits me perfectly. My neck comes right up against the head support cushion. The lumbar support cushion also fits perfectly in my lower back. After trying a few other brands of gaming chairs I can say that the lumbar and head support cushions of this chair are far softer and more comfortable than theirs. One thing to mention, this chair is a little firmer than I was expecting. However it softens up after a week or two of use. The firmness is also a sign of good quality padding and means that the chair will stay comfortable for much longer. Not that you should worry about the seat of this chair ever wearing down that much but if it did, there is a couple of tight elasticated straps under the seat instead of a plank of wood, meaning that even if the seat itself was to wear down over time the chair would still be incredibly comfortable. The arm rests of this chair are far more adjustable than most other armrests on other chairs (they can be moved up/down, in/out, forward/backwards). They may look like plastic but they are actually padded and comfortable to rest your arms/elbows on. The bucket style of the chair hugs you ever so slightly, giving that "cosy" feeling but because it is only a subtle "hug" it means that people with broader shoulders or a wider waist will still fit comfortably in this chair without fear of the chair's design imposing on them and causing discomfort. The base of the chair is made of metal and is very strong. You are able to recline extremely far back in this chair (not as far back as some other chairs, but I've never felt the need to lie completely horizontal, however, if you were to tilt back on the chair and recline the entire way you could get it to be basically horizontal if you need that). The height function of this chair surprised me, I usually use it on just above the lowest setting, but on the highest setting I can barely touch the floor! Could be useful to those with a foot stool under their desk or those who have very long legs or a tall desk. Overall the design of the chair is very luxurious and professional. It takes the typical gaming chair aesthetic and removes the garish bright colours in exchange for subtle trims of colour which look a lot more mature. This chair was one of the best upgrades I made to my PC setup and I would highly recommend it to anyone looking for a new chair. Great quaility and great comfort. A very high quality gaming chair, with great flexibility and comfort. Also easy to assemble! A chair worthy of the name! Every confidence that OCUK will sort this out and in turn get in touch to provide improved hydraulics for shorter people like myself. For now, want this review to stand out to warn others. I won't likely be able to use this chair without a foot rest or stand. I am 5'7 and on the lowest high available, my feet are unable to touch the floor without big shoes on. So that means I can have my knees at right angle to relax and put least amount of pressure on my quads or knees. Called OCUK just now, and looks like they are all sitting on them, with coworker of my height in same position, unable to touch floor and legs dangling. For a chair to call itself ergonomic it needs to hold the human body in a supported and relaxed position, not just look cool and be bucketed. My knees hurt a bit from gaming on it for 2 hours last night. Good news is that this chair could be ideal, just need OCUK and NobleChairs to come out with a hydraulics that has a greater range of adjustment, supporting users who are 5 ft onwards. Deserves 2.5 stars now, for tall people have nothing to complain about. Excellent chair, well worth the price! Package is extremely heavy I had to unpack the chair to carry to where I wanted it. This is without doubt the best chair I have ever had, and is extremely comfortable. I would highly recommend this as an option to consider for anyone buying a chair especially if you have a larger frame, I am just over 6 foot and weigh in the region of 18 stone, for me the chair is perfect. Took a while to get used to and be wary if you are short. I bought this noble chair to replace my old gaming chair which had been a bit battered and bruised when I bought it about 3 years ago. It's extremely comfortable and gaming in it for 10 hours is easy. take me about 15/20 minutes to get the chair up and running. To some it all up Noble gaming chairs are the best iv ever had. I really can no recommend this chair. This chair is the mutts nuts! I'm in Love! Everything came packed well, all in top quality packaging. It took me about 45 minutes to put it all together! I am now sitting in this chair and its heaven! I am in Love! 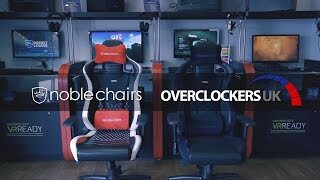 Thank you OverClockers UK, I will be doing more business with you! The quality of this chair is outstanding! I recommend this chair 100% !! I'm a relatively tall (6'2) and broad guy and I was looking for a high back chair which is both comfortable and durable. This chair seems to fit the bill. It's extremely comfortable and when adjusted it makes your back feel like heaven. I also had an issue with delivery but a quick phone call to OCUK and they offered me a game, mug and mouse mat as an apology. Extremely pleased with the chair and customer service. I bought this chair to replace my old desk chair which had been a bit battered and bruised when I bought it, let alone 4 years later. This chair is definitely the best chair I have ever sat on (and at work I have a special £300 chair for my bad back). It took about an hour to set up, but it will no doubt take anyone else less time to set up. All of the tools, screws & washers are included in the box. The Allen Key also doubles as a positive screwdriver in case you need to remove one or two of the screws like I did. The manual for building the chair is a bit sub-par, but its not as if you can't figure it out just by looking at the parts. I really can no recommend this chair enough.